This hash brown recipe is fool proof. It will give you crisp potato patties, just begging for a dash of hot sauce (or ketchup for the kids). The following instructions are for pattys, but you can also spread the mixture out in a big frying pan, then cut into wedges for serving. 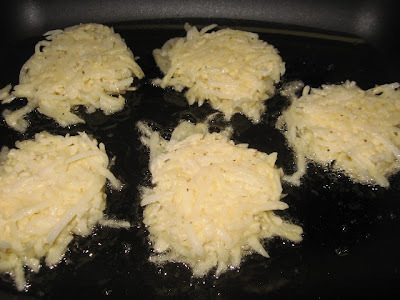 I use (the shredded hash brown style of) a product called Simply Potatoes (in my store they are sold in the refrigerated section above the eggs), but you can use THAWED Ore Ida shredded (loose) hash browns as well. I have tried fresh potatoes for this recipe and they do NOT work as well as Simply Potatoes or thawed Ore Ida shredded potatoes (fresh potatoes get mushy). Gently toss the potatoes with the flour, salt and pepper (and onion if you are using it), then gently (I use my hands) mix in the lightly beaten egg. NOTE: I mix the salt & pepper into the egg to make sure the spices are distributed evenly throughout the potatoes. Pre-heat your heavy frying pan to medium high and brush your skillet with a generous coating of vegetable oil (I like to use my electric frying pan). Place 1/3 (lightly packed) potato mixture onto HOT, greased frying pan and then gently flatten the mound with your spatula, like this: Fry patties for 4 minutes, per side, or until they are golden brown and crispy. Drain on paper towels, sprinkle with salt and serve immediately. 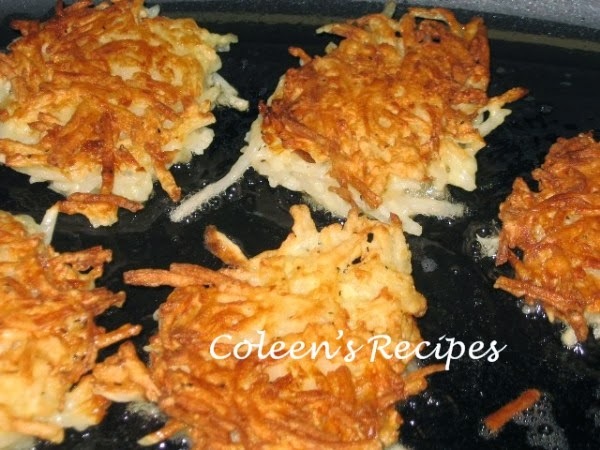 I love how these hash brown patties hold together, you can even pick them up and eat them like a commercial hash brown patty, but oh so much better tasting. NOTE: 3 cups of THAWED Simply Potatoes or Ora Ida equal about a pound. What a great golden color. I'll have to give this method a try. My down fall is usually not turning them too soon. I have been wanting to make these, but didn't know how. Thanks again for a wonderful recipe. 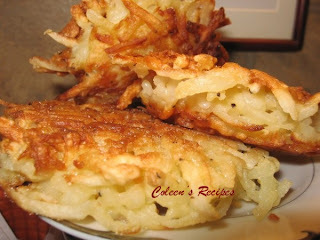 I love hashbrowns but can never get them to look like that! yours look perfect! YUM! 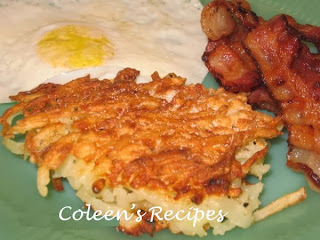 i've never been much of a hashbrown fan, but these look fabulous! My son and husband both love potato patties....they look delicious! Oh these look fabulous! I never have luck with home shredded potatoes, why? too thin mamybe? whatever I guess I'll make these. Made these tonight. They were a big hit! I made you meatloaf for two and your hashbrown patties for dinner. The meatloaf was great and the hashbrown patties were OUTSTANDING. So simple and so good. I am not sure my email will show up, but if it does I would like for you to let me know what brand of camera you use for your photos.